Sanal Heart-Tin can Dog is a nice storage tin with a nice content. This tin contains delicious and responsible yeast calcium treats. The tin has the lovely text "Home is where my dog is" on the lid. You can definitely keep using this tin after the contents are finished. Sanal Heart-shaped Tin for Dogs is a beautiful storage tin for all kinds of tasty snacks for your dog. 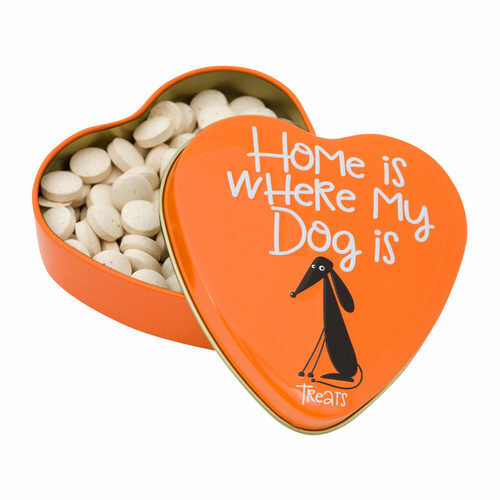 The heart-shaped tin has the fun text ''Home is where my dog is'' on the lid. This tin contains delicious and responsible yeast calcium treats. These treats are highly suitable for use during training. Yeast, milk and milk by-products, calcium phosphate, calcium lactate, calcium stearate. Have you used Sanal Heart-shaped Tin for Dogs before? Let us know what you think about this product.